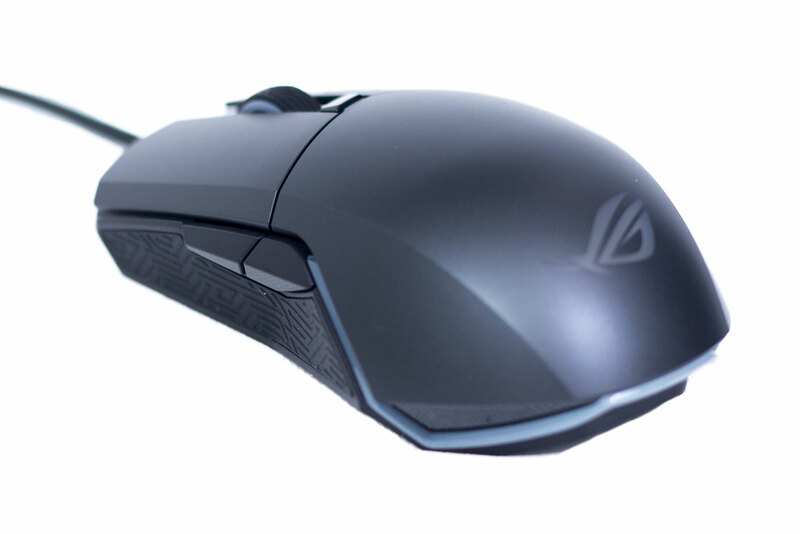 A few months ago we took a look at the Asus Impact ambidextrous mouse that failed to, well, make an impact. It lacked features and came with a hefty price tag. 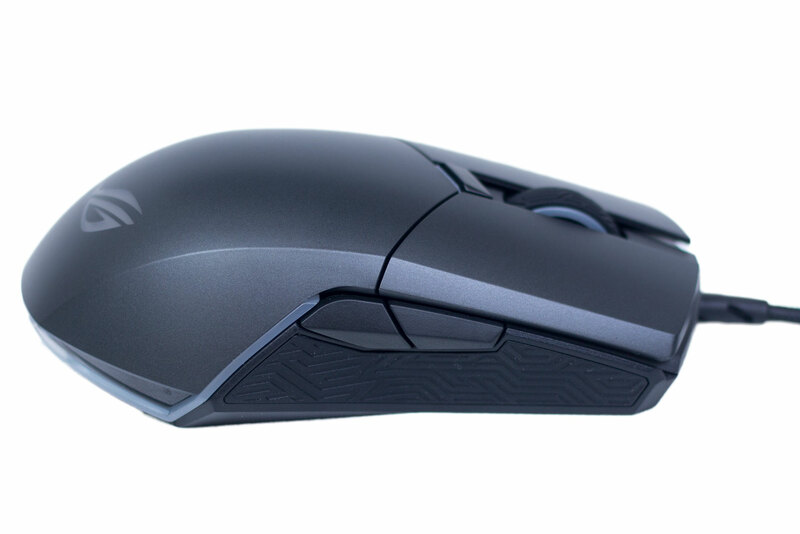 Now, Asus has released the ROG Pugio; this is another ambidextrous mouse which has far more buttons and, in turn, more functionality. We take a look at it to see if this one will impress us more. Inside the box, there is a nice little bundle of accessories. 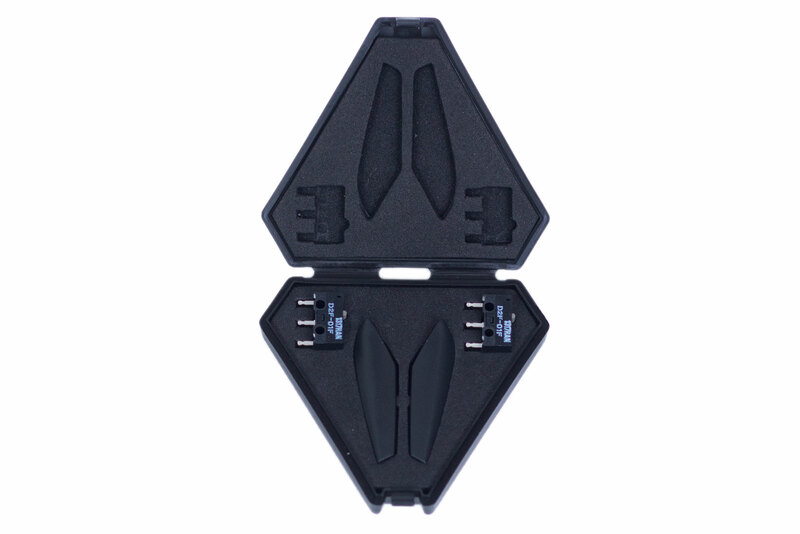 There is a little bag which protects the Pugio if you ever need to carry it anywhere such as a LAN. As someone who frequents LANs often, these bags are a great idea in my opinion. There is also an Asus ROG logo sticker and a small box of accessories alongside the usual user guide. 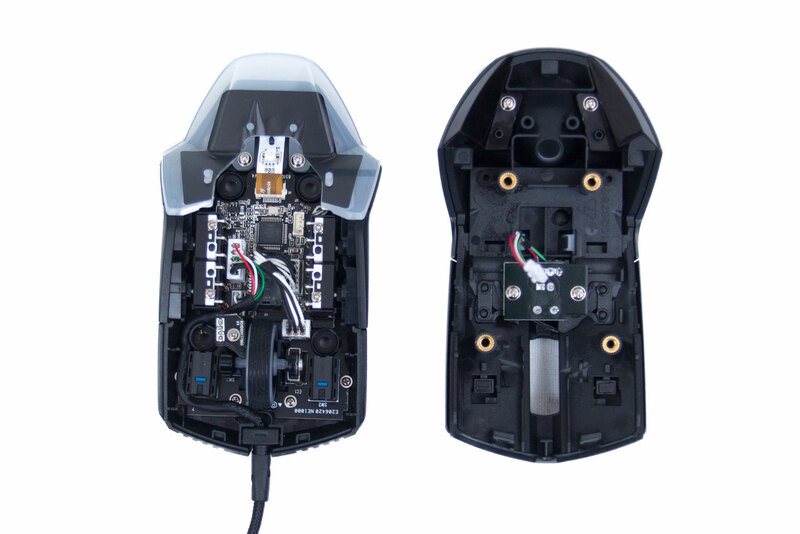 Being an ambidextrous mouse, both sides of the Pugio are symmetrical. This allows users who are left-handed to get the same experience as those who are right-handed. One in 10 people are left-handed, so it only makes sense that companies target that audience, although lefties do seem to get left out more often than not. 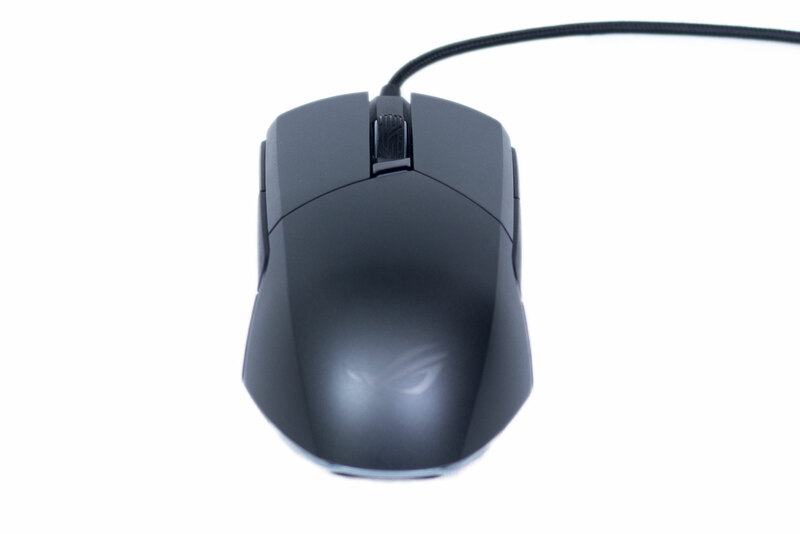 The mouse has three buttons on the top as well as a clickable scroll wheel. There is a nice resistance to the click and scroll on the wheel, but it is soft enough to use comfortably. The LMB and RMB can be clicked anywhere along the length of them giving people with both claw and fingertip grips a good surface area to deal with. Directly behind the scroll wheel is another button which controls the DPI by default. You can change this via the software if you wish to. 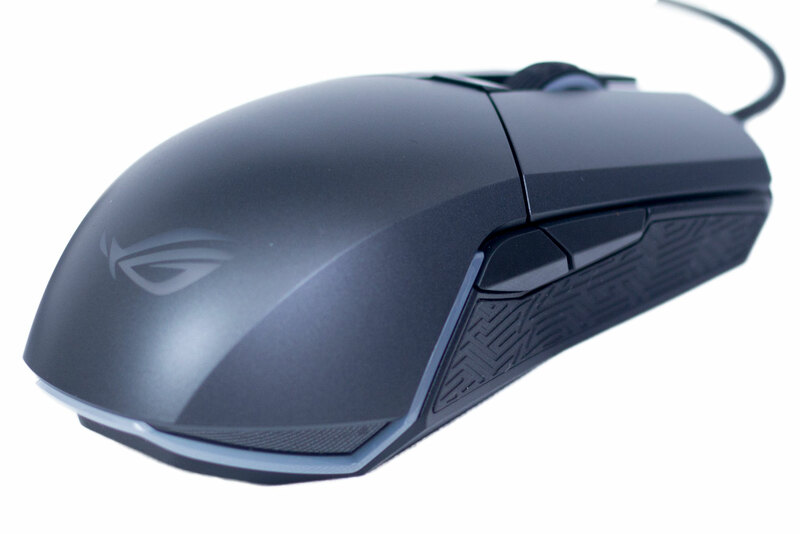 Looking at the bottom of the mouse we can see that even this has the Mayan design that Asus loves so much. There is also one large skate and two smaller ones. 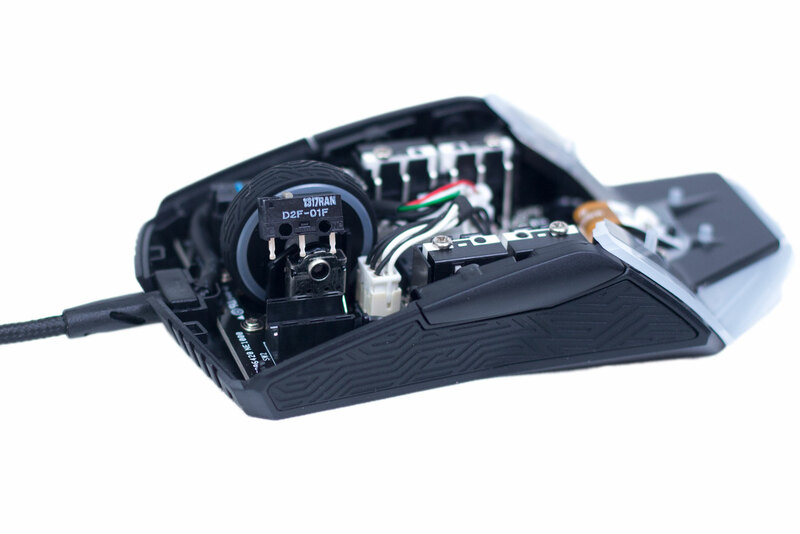 It doesn't look like there is a huge amount of surface area here, but the mouse does move nice and smoothly. 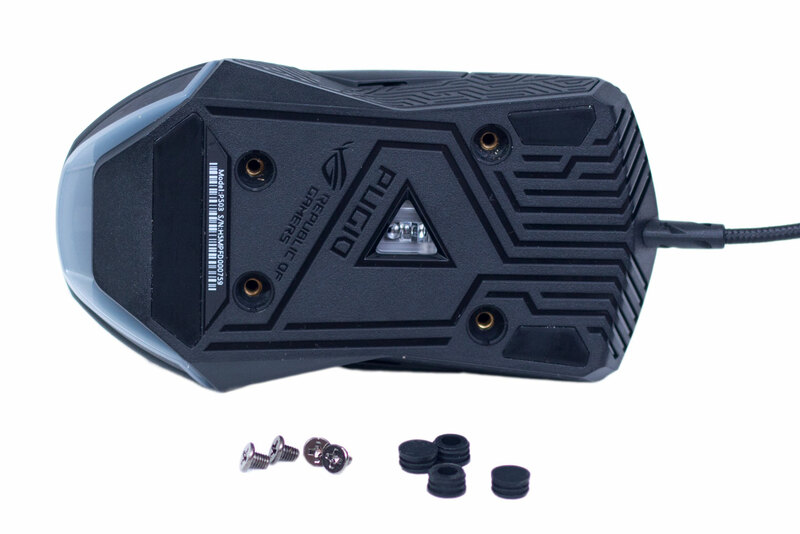 The spec sheet for the sensor says that it is a 7,200 DPI optical sensor with 150 IPS and a max acceleration of 30g. Although Asus doesn't mention what sensor this is, the specs look remarkably similar to the PMW3330. 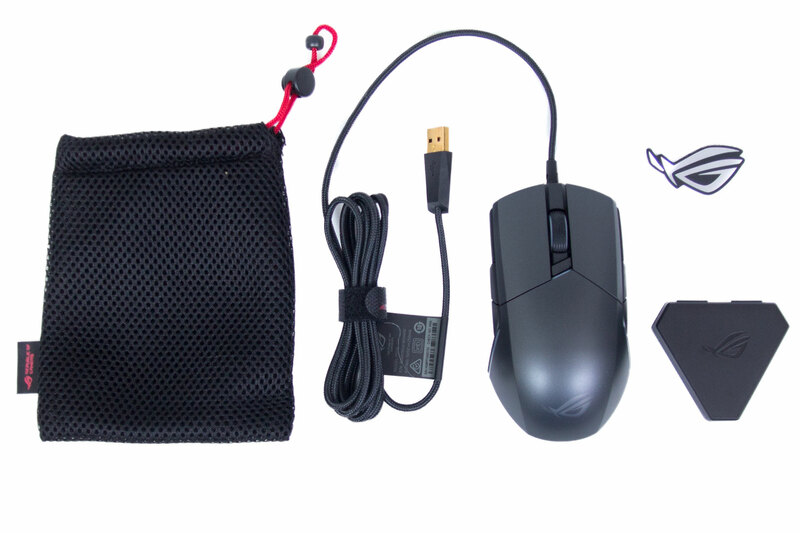 This sensor is in other mice such as the Cooler Master MasterMouse S and MSI Clutch GM60. Although we're not 100 percent sure that this is the sensor used in the Pugio, an educated guess suggests so. For the price it would have been nice to see something a little better like a PMW3360, but the 3330 is still a solid sensor. Inside the small case that is included with the Pugio, there are two spare switches as well as some blanking plates for the side buttons. The switches that are pre-installed are Chinese Omron switches, which feel a lot softer than the Japanese Omron switches in the accessories box. 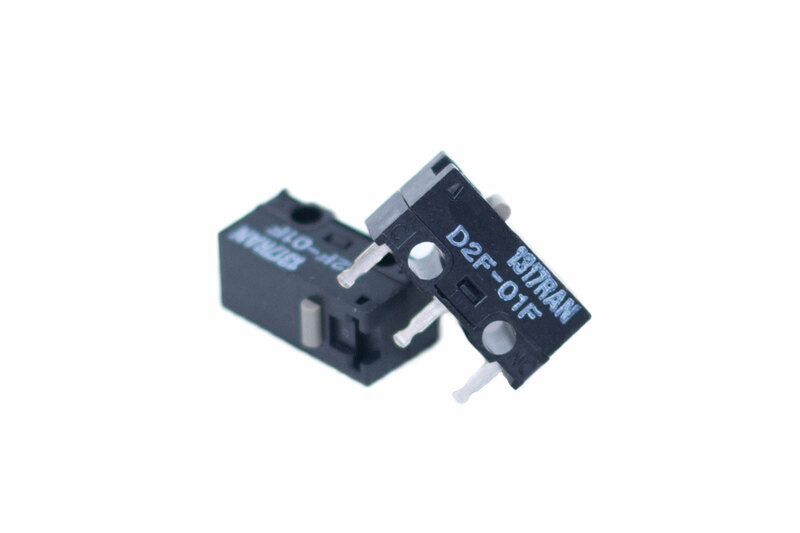 These kind of switches are widely available, so if you do want something that feels different, you would be able to purchase them separately. The buttons on both the left and right side can be removed; they are held on by magnets. They are sturdy enough not to fall off, but if you do rage whilst gaming, they can ping off. Yes, I have done this with my Logitech G900, and the design is very similar. 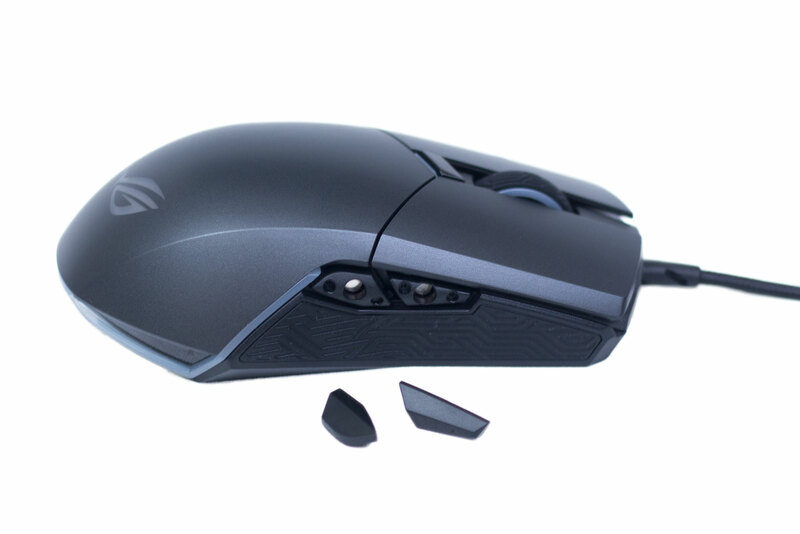 Some people will find that having buttons on both sides of the mouse makes those on the opposite side to your thumb hard to use, especially if you lift the mouse a lot to reposition it. We found that we accidentally pressed the buttons often until we got used to the shape, and the blanking plate was useful and stopped this from happening. Changing the switches is also very easy; you simply remove the rubber grommets and the screws and pop the cover off. 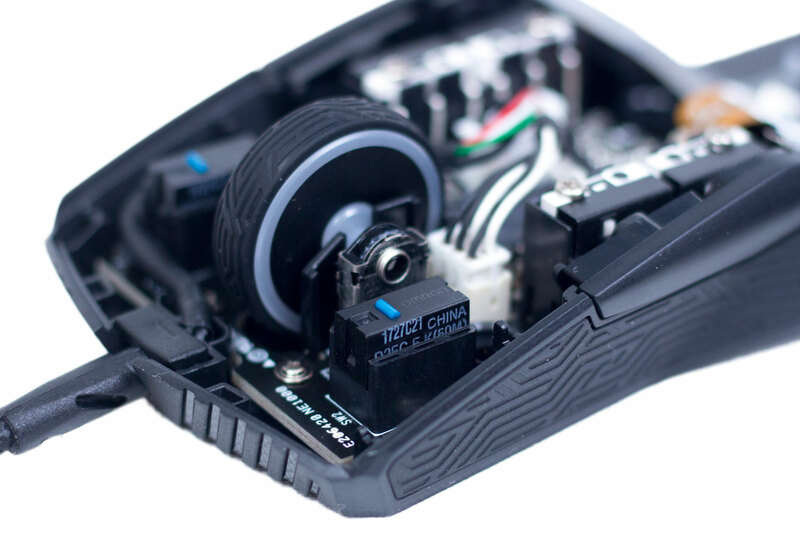 Make sure you are careful if you remove the cover, though, as there is a small cable that you need to unplug that connects the RGB LEDs. The installed switch simply pulls out, you don't need any tools to remove it. The replacement just pushes in, and there is no need to solder, so it is very easy to do. The side switches cannot be replaced like the LMB and RMB, but they are of good quality and do feel very nice to use. 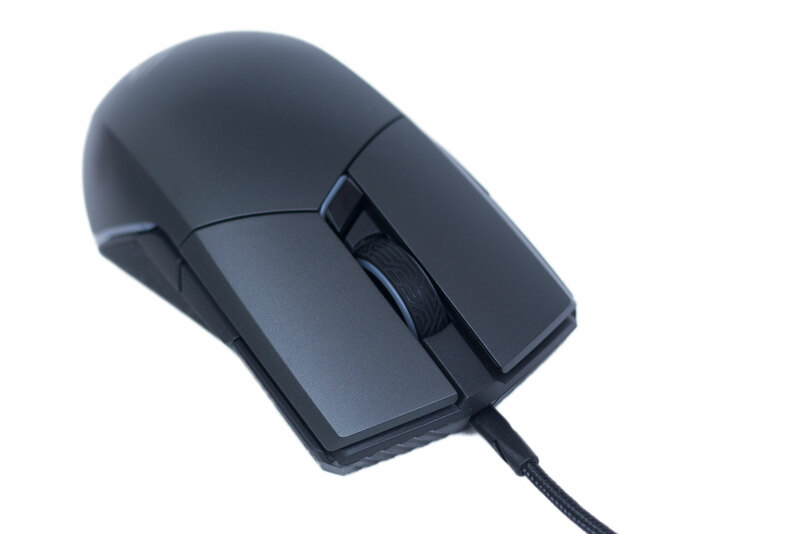 The mouse has a good shape, it isn't too bulbous, so palm grip is as comfortable as claw and fingertip grips. However, one thing we did notice is that due to the shape of the back, if you put too much weight on it, it does tip back. This was only an issue as I first started to use the mouse; once I got used to where to put the weight of my palm, it was no longer a problem. It is worth keeping in mind, though, as some people do like to put the weight right at the back of the mouse rather than further forward, and this is a bit more difficult to make work. As with everything in 2017, the ROG Pugio has RGB LEDs, with three separate zones. 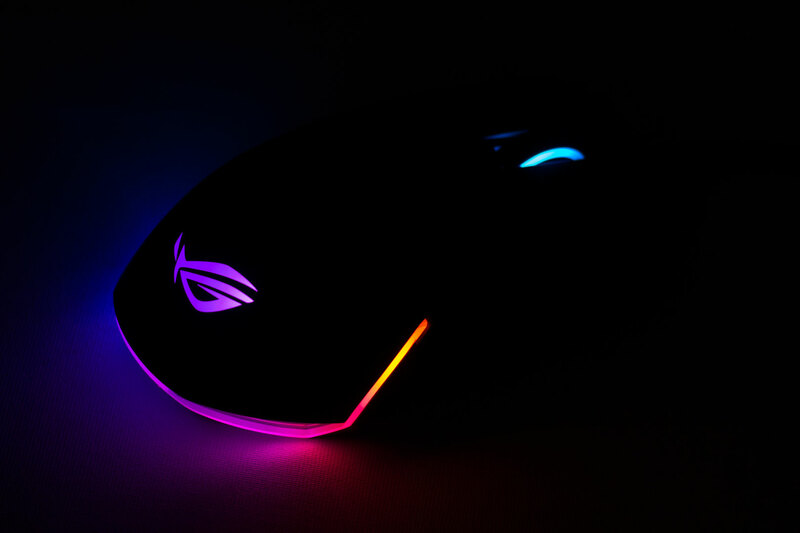 The ROG logo, the scroll wheel, and the strip at the back of the mouse can be independently changed, and the LEDs are vibrant and bright. Okay, so a lot of people don't care about RGB, but I must admit, I did like the way the Pugio looked. Overall, the hardware is solid and comfortable to use, but with a price tag of almost £70 it needs to be backed by a good software suite, so let's check that next.